Continuous recording of load, depth and time during the indentation of three or four sided diamond pyramids. 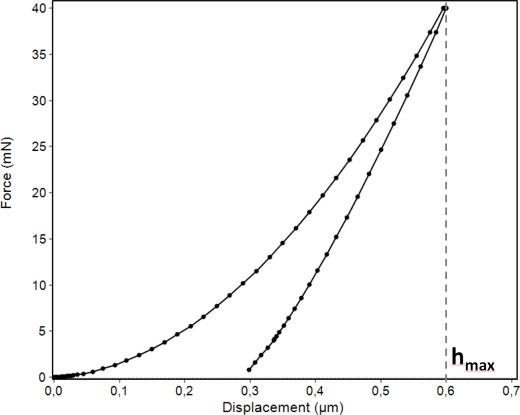 Calculation of the contact area under load from the maximum indentation depth hmax and the known indenter shape. Elastic and plastic parts of the deformation are not distinguished or separated. Therefore this hardness definition cannot be well compared with other hardness definitions. The sample has to be either 10 times thicker than the indentation depth or 3 times thicker than the indentation diameter. Realization of the test at stable temperature conditions. External temperature influences have to be controlled and the temperature has to be kept stable; otherwise a drift correction has to be carried out. The zero point of the measurement (sample surface) has to be determined with an accuracy < 1%. Vertical and shock-free appliance of the test load. The exact measuring cycle is to be indicated. F. Fröhlich, P. Grau, W. Grellmann, Performancs and Analysis of Recording Microhardness Tests, phys. Stat. Sol. (a) 42 (1977) 79-89. The development of the former universal hardness (now: Martens hardness) has been undertaken, especially in Germany, in connection with the development of the measuring device Fischerscope H100. It dates back to work of W. Weiler of the "Physikalisch-Technischen Bundesanstalt" as well as to D. Dengel and H.-H. Behnke. W. Weiler, Zur Definition einer neuen Härteskala bei der Ermittlung des Härtewertes unter Prüfkraft, Materialprüfung 28 (1986) 217-220. Through relating to the maximum indentation depth the hardness value can be deduced and measured easily and without taking a model as a basis. However, it gets bought through mixing elastic and plastic characteristics and due to the bad comparability with existing hardness definitions especially with very elastic materials.